My name is Carlos Clemente Cruz. I'm an engineer and a competitive cyclist. My new bicycle is a fixed gear MTB. I've been building my frames for a few years, but the name Clemente goes back a long way. The first Clemente in my family was my grandfather, a serious, purposeful man. He passed his name and qualities down to my father, who gave them, in turn, to me. When I began to design frames, I always built for a specific purpose: 'cross, criterium, track... But, a few years ago, I got an idea for a bike that didn't fit with those existing categories. The idea came at the start of the off season. I follow an oldschool training regime, which means lots of fixed gear riding in the winter. I had a run of lonely cold nights at Brian Picollo Velodrome coming up, and I was dreading it. One evening, it hit me: wouldn't it be great if I could do those muscle-pumping workouts somewhere that wasn't as boring as the track or as dangerous as the road? In fact, wouldn't it be great to ride a fixed gear on the Levee? I told myself that the idea was crazy, but I couldn't shake it. 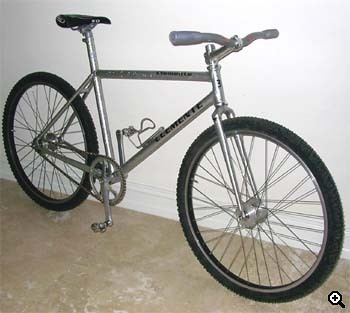 I went on the 'Net and looked for 'offroad fixed gear'. Google turned up 63xc.com. Aha! A moment of clarity. The Clemente fixie was on its way. I started to sketch out how my fixie MTB would work. I wanted it to maneuver like an MTB, but otherwise to stay as close to my track bike as possible. Wheels would be critical. I needed light, narrow tires. Well, the choice was easy: Hutchinson Cross Comp 1.3s, a 'cross-style tire, about the same size you'd see on an old roadster. Since the thin tires would transmit a lot of shock, I'd be needing strong, stiff wheels. I chose hubs from LeVel Components, CNC'd aluminum with flanges more than three inches in diameter. Laced to 36H Sun Rhyno Lites by my friend Rudy, these gave me the toughest light wheelset I'd ever seen. 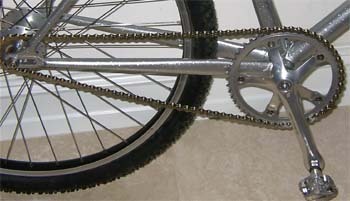 I opted for a bulletproof drivetrain, too, mating a 1/8" track chain, cog and ring with 175mm Superbe Cranks. Now it was time to think about the frame. This was tricky. I was going to combine characteristics from a track bike and an MTB, characteristics which aren't normally found together. Still, since I was planning to build the entire frame by hand--'hecho a mano', as we say in Cuba--I knew I could make it work. The slim wheels enabled me to put together a tight frame with a standard road rear end: 16mm cylindrical seat stays and 30/16 oval chainstays. I chose a compact design because I like the looks, but I extended the seat tube way past the seat cluster to avoid whippiness and used a big 30.4mm seat post to eliminate the last bit of flex. Weight wasn't a problem, but my preference for lugged construction and a 1" steerer created a dilemma -- how could I hold the different tube diameters together in one design? Fortunately, Dedacciai's tapered tubes let me work it all out. I chose a top tube with a 31.8 -- 28.6 taper and a downtube of 35 -- 31.8. Unusual tubing and tight clearances aside, the geometry was pretty standard: 71 degree head and 73 seat, 50mm BB drop, and weight distribution close to my track bike. Once I had the frame brazed up and the lugs filed, it was time to pick a colour. I wanted it to be simple but strong. I chose 'Disco Silver'--a light metallic shade with polychromatic sparkles. It went well with the silver components. Result: a purposeful and almost unbelievable ride. Now I could look forward to winter training! Carlos Cruz runs Clemente Cycles, a Florida, US frameshop building in lugged steel. Learn more about Carlos' steel frames at the Clemente Cycles website. Carlos' wheels were built by his friend Rudy. Carlos' mega tough hubs are made in the USA by LeVeL.